Production: L'Ecran Français and Les Films Etienne Lallier; black and white, 35mm; running time: 100 minutes; some versions are 85 minutes. Released 11 February 1947. Filmed from about 1944 to 1946 on location at the farm Farrebique. Producer: Jacques Girard; screenplay: Georges Rouquier, from an idea by C. Blanchard; photography: André Danton; editor; Madeleine Gug; sound: Lecuyer; music: Henri Sauguet; special effects: Jean Painleve, Daniel Senade, and Jean-Jacques Rebuffet. Cast: The Owners of the farm of Farrebique and some of their neighbors as themselves. Rouquier: Album de Farrebique , Paris, 1947. Barnouw, Erik, Documentary: A History of Non-Fiction Film , New York, 1974. Armes, Roy, French Film Since 1946: The Great Tradition , New York, 1976. Auzel, Dominique, Georges Rouquier: cinéaste, poète & paysan , Rodez, 1993. Sight and Sound (London), Winter 1946–47. Cinéma Français (Paris), 15 February 1947. New York Times , 24 February 1948. New Republic (New York), 1 March 1948. Time (New York), 15 March 1948. Monthly Film Bulletin (London), 30 April 1948. Bowser, Eileen, "New Acquisitions: Le Tempestaire and Farrebique ," in Museum of Modern Art. Film Notes , (New York), 2 and 4 April 1978. Weiss, J. H., "An Innocent Eye? The Career and Documentary Vision of Georges Rouquier," in Cinema Journal (Evanston, Illinois), Spring 1981. Jeune Cinéma (Paris), January 1984. Olive, Jean-Louis, " Farrebique , Biquefare ou les morçeaux de la memoire," in Cahiers de la Cinématheque , no. 41, Winter 1984. Berelowitch, Iréne, and Jacques Siclier, "Le printemps revient toujours. Farrebique ou les quatre saisons: Biquefarre," in Télérama (Paris), no. 2252, 10 March 1993. Auzel, Dominique, "Georges Rouquier, cinéaste, poète et paysan," in Séquences (Haute-Ville), no. 170, March 1994. Sorlin, Pierre, "'Stop the Rural Exodus': Images of the Country in French Films of the 1950s," in Historical Journal of Film, Radio and Television , vol. 18, no. 2, June 1998. The roots of the style which George Rouquier brought to full maturity with his first feature-length film, Farrebique , released in 1946, lie in a number of short documentary studies of rural crafts, such as Le tonnelier and Le charron , which the director had made during the Occupation years. 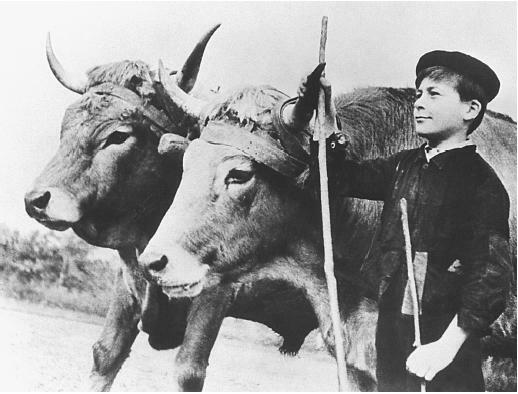 In the immediate post-war years, Farrebique 's picture of French farming life was hailed as a break with the past, its deeply-felt concern to present realist detail being contrasted with the escapist fantasy that was felt to characterize the cinema of the Pétain years. Certainly this aspect of the film remains impressive. The everyday activity of the farming family is precisely observed—the breadmaking, ploughing and harvesting, evening prayers, and trips to church or bistro—and forms the context for the film's fictionalized sequence of events. They include the grandfather's account of the family history, his death and the birth of a baby, the younger son's injury and engagement, and they are staged in a slightly clumsy fashion which is in perfect keeping with the film's strategy of presenting its story as a "real" document. The understatement of joys and sorrows and the unemphatic playing reinforce this tone. But the film as a whole does not have any of the coldness or objectivity that such a stance might lead one to expect, for these family events are not presented neutrally but are fitted into what can be aptly characterised as a pageant of the seasons. The director views nature with true poetic intensity, stressing always its dynamic aspect, particularly in the long lyrical passage celebrating the coming of the spring. This vision allows the film to remain optimistic and affirmative despite the inclusion of such events as the grandfather's death, which can be seen as part of a rhythm of change and development. Though moving in itself, this death is merely part of the process of seasonal renewal and can be supplanted by the son's engagement and the promise of spring. In the mid- and late-1940s, Farrebique was generally seen as belonging alongside René Clément's documentary drama La bataille du rail , about the French railway workers' efforts to resist the German occupiers, as an example of the postwar French realism which failed to develop on the lines of that emerging during these years in Italy. Comparisons with Italian neorealism are fruitful, for it is immediately apparent that Rouquier has not attempted to integrate rural life into a wider social framework. In Farrebique virtually the only contact with the outside world concerns the installation of electricity, and even this is treated as a comparatively minor incident and incorporated in the film's conception of change as part of a natural rhythm. value, relating closely to André Bazin's 1940s advocacy of realist styles, it can be seen in retrospect as somewhat limited. Bazin's formulation of the problematics of realism leaves out of account any consideration of political issues. Yet from today's perspective one of the most fascinating aspects of Farrebique is the way it questions the neat separation of Occupation years from the postwar renewal that underpins so many accounts of France in the 1940s. Planned during the Occupation, Farrebique reflects the all-pervasive influence of the Pétainist ideology of "work, family and fatherland" at least as strongly as it affirms a new postwar realist approach. Far from lessening the value and significance of Farrebique , this essenial ambiguity makes it a key document for the re-examination of French culture that looks beneath the comfortable myths of Occupation and Resistance.